Among the latest new Lenses announced is an autofocus version of the Tokina Firin 20mm f2 FE (Sony E system) lens, with the “AF” designator added to the model name. No price/availability details yet but B&H Photo has created a product page for it. Another one of the B&H 2-Day Sale offers is the new condition Tokina AT-X 24-70mm f/2.8 PRO FX lens offered for $619 with free expedited shipping in the Canon EF mount. The Nikon version is NOT on sale. Macro time! The new condition Tokina 100mm f2.8 AT-X M100 AF Pro D lens is on sale for $350 with free shipping and 4% promotional rewards at B&H Photo and Adorama for a limited time in the Canon and Nikon systems. The new condition Tokina Cinema 11-16mm T3.0 lens, only in the Micro Four Thirds option, is on sale, for a limited time, for $799 with free expedited shipping at B&H Photo where it also gets 4% promotional rewards (around $32 to spend in the future at B&H). This is among the latest B&H Featured Sales. Canon APS-C shooters! B&H Photo has a doorbuster for you! For a limited time, you can get the new condition Tokina 12-28mm f4 AT-X PRO DX lens for $249 with free expedited shipping! For more action, check their latest Featured sales. Macro time! The new condition Tokina 100mm f2.8 AT-X M100 AF Pro D Macro can be yours for $325 after a $30 mail-in rebate (MIR) in the Canon mount and $350 after a $30 MIR in the Nikon mount at B&H Photo with free expedited shipping. New promotion has now gone live at B&H Photo, the new condition Tokina 14-20mm f2 PRO DX [CORRECTED LINK] along with $24~ in promotional rewards is offered for $599 with free expedited shipping at B&H Photo in the Nikon and Canon systems. We have another Tokina lens sale, and again, the sale is restricted to only one of the options. The Nikon F mount version of the Tokina 11-16mm f2.8 PRO DX-II is on sale for a limited time for $430 with free shipping at B&H Photo along with 4% promotional rewards ($17~ to be used in future B&H purchases). Expiration date unknown. If you are a fan of M43rds, Tokina, and video, we have good news for you! The Tokina Cinema 11-16mm T3.0 for Micro Four Thirds is on sale for $999 with free shipping and 4% promotional rewards (around $40 to be used in future B&H purchases) at B&H Photo. Only the M43rds mount is on sale at this price. 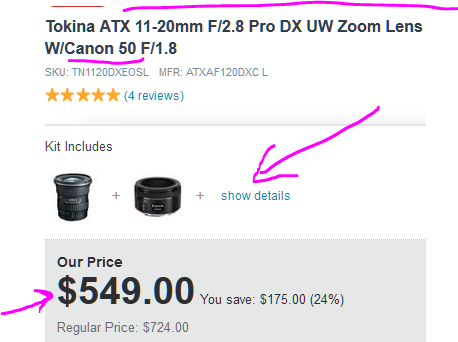 I just updated the Holiday Deals Situation Room, and there’s another discount at Adorama on the Canon version of the Tokina 11-20mm f2.8 Pro DX for $460 after a $40 mail-in rebate. You also receive $20 in promotional rewards to be spent in future purchases at Adorama. The Nikon version goes for more. In-progress now is updating the Holiday Shopping Situation Room. I am removing both expired offers and also offers that lingered there since Cyber Monday. The idea is now that the Black-Cyber week is over, to make this more lightweight and robust. That updating brought a new discount with it, in addition to the previously mentioned Canon D-Rebel drops, the Nikon mount version of the Tokina Tamron 100mm f2.8 (Nikon) is down to $340 after $20 MIR (mail-in rebate) at Adorama. It was $350 AR before. It also gets 4% promotional rewards, which dropped $0.40 since the price drop, now around $14.40~ to be used in future Adorama purchases. BLANKET CORRECTION: this is a Tokina lens, not a Tamron lens. Who knows how many other times I wrote this as Tamron 🙂 Thanks to Mike for pointing it out in the comments! I always get Tamron and Tokina confused 🙂 Of all the names, they both picked six-character T-names with the only difference being two characters in each (“mr” vs “ki”). F2 zoom lenses are a thing too these days, partially thanks to the DX format, which brings us to the Tokina 14-20mm f/2.0 AT-X Pro DX lens bundled with a boatload of free accessories for $599 with free shipping at Adorama in the Nikon mount and Canon mount. The free accessories are: 82mm Pro-Optic Filter Kit, Slinger Lens Case, lens cap tether, cleaning kit, lens shade, and an updated Corel software bundle that includes Paintshop Pro X9 and VideoStudio 9 and AfterShot PRO 2. Both are in-stock with free shipping. Not a big discount but a discount it is, the Nikon version of the Tokina 100mm f2.8 AT-X PRO D lens is available for $350 after a $20 mail-in rebate (MIR) at Adorama. You also receive $15~ in promotional rewards to be used in future purchases at Adorama. The mail-in rebates expire 12/31/16. Adorama has a new coupon promotion, this is another coupon by email, you receive the coupon code by entering your email in the Promotional page. The items you see on that page will get discounted by an unspecified amount using the coupon you receive. Participating items include tripods from Manfrotto and Benro, lenses from Tokina (11-20mm f2.8, 14-20mm f2) and Rokinon (50mm T1.5 Cine), camera bags, battery grips from Canon and Nikon, and a lot more. The NAB specials are running in all directions, here’s another one. If you are a fan of Tokina’s Cinema T-lenses (yes, they make those too), there is a sale on nine of those lenses at B&H Photo with the Canon EF, PL, and M43rds mounts represented with various T3.0 zooms and other lenses. They also earn 4% promotional rewards. Most of the NAB Specials at B&H expire on 4/21/16 PM, and that’s when the B&H offices will close until 5/1/16, so factor that in your purchase planning. Another Tokina offer, their 16-28mm f2.8 PRO FX lens is currently on sale for $589 with free shipping and 4% promotional rewards (around $23) in the Canon or Nikon SLR mounts at B&H Photo. Offer ends 3/31/16 at 11:59pm ET. If you prefer free accessories instead of 4% promotional rewards, Adorama is bundling it with a flex lens shade, a slinger soft large lens case and a cleaning kit. While the Tokina 11-20mm f2.8 is the B&H Photo Daily Deal (ends Tue 11:59pm ET), the Tokina 11-16mm f2.8 AT-X 116 PRO DX-II is on sale for $450 with free shipping and 4% promotional rewards ($18~) at B&H Photo in the Canon, Nikon and Sony SLR mounts. Offer ends 3/31/16 at 11:59pm ET. This is an offer you don’t see every day. A free lens with purchase! That’s right, if you purchase the Tokina 11-20mm f2.8 DX PRO lens for the Canon EF mount for $550 (the authorized dealer price), you will automatically receive a FREE Canon 50mm f1.8 STM lens from Adorama’s website. No coupon needed, the free lens is shown on the product page while this promotion is running. This is a limited time while supplies last type of an offer (I do not know when it expires). The Tokina 11-16mm f2.8 AT-X PRO DX-II lens, in the Canon, Nikon and Sony-Alpha-Minolta SLR mounts is currently on sale for $450 with free shipping and 4% promotional rewards ($18~) at B&H Photo. No mail-in rebates. To the eBay Deals we hurry where Robert’s Digital (aka Robert’s Imaging of Indianapolis, popular in the Midwest) is offering the new condition Tokina 11-20mm f2.8 PRO lens for $430 with free shipping in either Canon or Nikon, with a limit of five per customer. It comes with a 3-year USA warranty. While there on eBay, the BuyDig eBay store is offering two 128GB Sandisk Ultra microSDXC UHS-I Class 10 memory cards with full SD adapters for $90 with free shipping. Limit five 2-packs per customer. It’s pre-orderin’ time, and not a typo, it’s f2 as in f2.0 as in f-two. The new Tokina 14-20mm f2 DX PRO AT-X is available for pre-order for $900 at Adorama in the Canon mount and the Nikon mount. The Canon mount is expected to come out early February, while the Nikon mount in early March. The credit cards are charged when the item ships, not when you place the pre-order. Happy f-two-oooing. Tokina has a little bit of a charm offensive to tempt Canon and Nikon DSLR shooters. Their latest sale is the 16-28mm f2.8 PRO FX on sale for $500 with free shipping and $20~ promotional rewards in the Canon and Nikon mounts at B&H Photo. Tokina APS-C action now, their Tokina AT-X 11-20mm f2.8 PRO DX lens, available in the Canon and Nikon DSLR mounts, is on sale for $469 with free shipping at B&H Photo. No coupons, no mail-in rebates, that’s what you pay at checkout! The action continues at the eBay Deals where Robert’s Digital (aka Robert’s Imaging in the midwest) is offering the new condition Tokina 11-20mm f2.8 lens for $429 with free shipping, in either the Canon or Nikon SLR mounts. Limit five per customer. It comes with a 3-year warranty. Tokina time. This offer ends by the end of day on Monday 10/26/15, B&H Photo is offering the Tokina AT-X 116 PRO DX-II 11-16mm f2.8 for $400 with free expedited shipping and 4% promotional rewards (= $16~) in the Canon mount and Nikon mount and Sony-Minolta mount. The lens party continues at B&H, this time for Nikon DSLR photographers, the Tokina 11-16mm f2.8 DX II ATX lens is on sale for $400 with free expedited shipping and 4% promotional rewards ( = $16~). The Canon and Sony Minolta Dyxum A-mount also go for $400 but don’t get the 4% promotional rewards. The all important f2.8 pro zooms have a new member today. Tokina has revealed a new 24-70mm f2.8 AT-X DSLR lens, available for pre-order for $1000 at Adorama in the Canon mount and the Nikon mount. As usual, the PDF files of the mail-in rebates are available on the individual product pages of items eligible for them at Adorama. This limited time sale expired… The Tokina 11-16mm f2.8 ATX Pro DX II lens is on sale for $430 with free expedited shipping and 4% promotional rewards (=$17~) at Adorama in the Canon mount or the Nikon mount or the Sony Alpha mount. Tokina has revealed a new APS-C DSLR, the 11-20mm f2.8 DX available in the Canon and Nikon SLR mounts for $600, with pre-orders at Adorama. Tokina also has a new Cinema 50-135mm T3.0 for the same mounts, with a cinematography preorder price of $4500 at Adorama. For 2015, we are keeping track of only interesting new cameras and lenses in this Interesting Cameras of 2015 Reference post. Keep in mind, we are now out of the breaking news cycle, so that reference post will not be updated the moment a new camera or lens is announced. This limited time offer ended… Wide Tokina action now at Adorama where the Tokina 11-16mm F/2.8 ATX Pro DX II is going for $465 with free shipping at Adorama. No coupons, no rebates, just add to cart and checkout. It is available in the Canon mount and Nikon mount and Sony A-mount.